Today, HPS releases the first report in a series of three intended to jumpstart a discussion of the economic policy path forward, both in terms of politics and policy. The primary cause of the economic crisis in 2008 was a credit bubble, which caused inflated asset prices and elevated levels of debt, seen most notably in the housing market. When the credit bubble burst during the financial crisis, unemployment rose and asset prices fell, but the elevated levels of debt remained. Since the financial crisis in 2008, households and financial institutions have been working to reduce the debt accumulated in the years leading up to the collapse. This process has become known as “deleveraging” and generally involves the use of income to reduce outstanding loans rather than fund spending or investment. As individuals simultaneously increased savings to pay down debt, reduced demand prolonged the recession and tempered economic growth, again impacting individuals and creating a vicious circle that impeded true recovery. 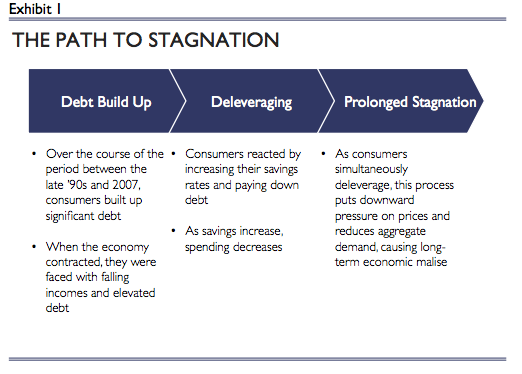 These and other factors have contributed to the extended economic stagnation we are currently experiencing. Our economic output (in real GDP) is 8 percent below trend, with unemployment elevated above 9 percent, and expected to remain there until 2013.